A Moon Full Of Stars by Jon Mollison! There’s another Jon out there in SF who’s very much worth your while, and his name is Jon Mollison. He writes in the vein of the old school pulps like very few I’ve seen. 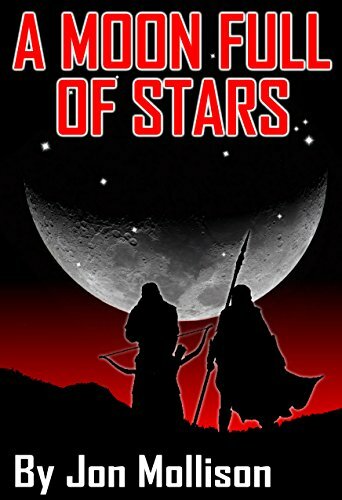 If you’re into hard action/adventure in your sci-fi, this work’s for you. Fun fact: he’s also an audiobook narrator, most recently known for John C. Wright’s Somewhither (in which he did a stellar job, about one of the best readers I’ve ever heard on a book). This story looks to be a planetary romance-style book in the tradition of Leigh Brackett. I’m pretty excited. All Rome ever wanted was to earn a place in the village as a hunter, so that he could explore beyond the safe confines of the village farm fields, but when monstrous slavers destroy his village he is forced to head west into the irradiated wastelands in search of anything that might give him the power to save his people. Accompanied by his chief rival, his journey takes him farther than he ever imagined. You can buy A Moon Full Of Stars here. This entry was posted in Book Blast, Space Opera, Writing by otomo. Bookmark the permalink.